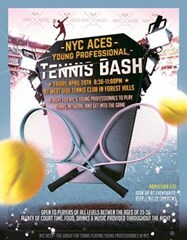 Come enjoy a night for NYC's young professionals to play tennis, network and get into the game! NYC Aces is USTA Eastern Metro's group of young professionals (21-35 year olds) for all levels of tennis players and tennis enthusiasts. We host social events in New York City so you can meet people and learn more about volunteer and leadership opportunities in the NYC region.